Universities are drowning in data, not only data produced by their researchers and students, but also data they collect about their communities. Research data are subject to sharing and retention requirements by funding agencies and journals. Data from course management systems, faculty personnel records, security cameras, and social media are being used as indicators for decision making. This talk will identify some of the challenges faced by universities in managing and governing these complex categories of data. 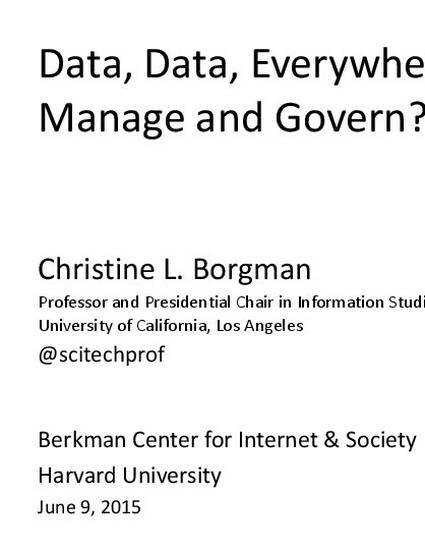 Material is drawn from Big Data, Little Data, No Data: Scholarship in the Networked World (Borgman, 2015, MIT Press) and the UCLA Data Governance Task Force.